When history tallies up the biggest losers of the Great Recession, it's not hard to guess who will top the list. Facing a brutal job market, plummeting wages, and a mountain of debt that has reached unprecedented heights, many recent college graduates have fallen behind before they've officially started their careers. And recent analyses suggest that the degrees they worked so hard -- and borrowed so much -- to earn are increasingly leading to jobs that don't make use of their high-priced educations. The first problem is debt: In 2010, college graduates left school with an average of $25,250 in outstanding loans, a 5% increase over the previous year. And the debt level isn't going down: Experts have estimated that the class of 2011 left school with an average loan burden of $27,200. It isn't hard to see why students are borrowing so much money. College tuition has increased by 60% over the past 10 years, as cash-strapped states have cut funding for higher education. This, incidentally, is part of the reason for the recent UC-Davis demonstration that ended with a mass pepper-spraying: The students were protesting a 9% tuition hike that is meant to offset cuts in state funding. Currently, California provides only 17% of the budget for the UC system. So Why Go to School? Yet even with tuition soaring, students are still lining up for college: Matriculation rates only dropped by 2% between 2009 and 2010, and have trended upward over the last 40 years. The reason for this is clear: In an increasingly insecure job market, college is one of the few fairly sure ways to get ahead. According to a recent Pew survey, the lifetime earnings of college graduates are, on average, more than twice as much as those of workers with only a high school diploma. 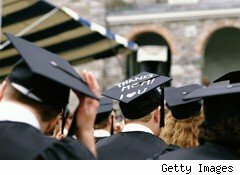 Even now, with unemployment high, college grads still have a definite edge. According to the Economic Policy Institute, unemployment among workers aged 25 and under without a college degree almost doubled from 12% in 2007 to 22.5% in 2010. In the same period, the unemployment rate among college graduates aged 25 and under went from 5.4% to 9.7%. In other words, while things are tough all over, they have been especially hard for workers who haven't gone to college. I Went to School for This?!? This isn't to say that recent grads are actually finding work in their fields. According to a survey conducted by Rutgers University's John J. Heldrich Center for Workforce Development, just 44% of college graduates characterized their first job as "closely related" to their area of study, and a mere 27% characterized their first job as "a career." Only 52% felt that their college degree was necessary for their job, and 33% felt that they were working below their educational level. So where are these recent grads working? In an analysis of college graduates aged 25 to 34, The New York Times determined that many were swelling the ranks of the food service, restaurant and bar industries. Between 2008 and 2009, the numbers of college grads tending bar increased by 17%, as did the number of grads working in gas stations, driving taxis and working the registers at convenience stores. While college degrees improve the chances of getting work, they aren't helping much when it comes to salaries. Average wages for cashiers and food service workers both hover below $10 per hour, while secretaries and administrative assistants make just over $15 per hour. According to the Heldrich report, starting salaries among college graduates have dropped by approximately 10% in the past three years, and many students are having a hard time servicing the student loans that paid for their education in the first place. Between 2010 and 2011, student loan default rates jumped by 25%, going from 7% to 8.8%. With total student loan debt rapidly approaching $1 trillion, this is poised to become a very big problem. Can You Beat the Curve? There are several things students can do while they're still in college to improve their employment odds later. According to a survey by the National Association of Colleges and Employers, students who interned were 38% more likely to get a job after graduation. That finding is corroborated by the Heldrich survey, in which 47% of students said that doing more internships would have helped them in their job search. Almost half of all respondents in the Heldrich study also said that they wished they'd been more selective in their choice of a major. As The New York Times recently noted, graduates who majored in education and engineering were most likely to get jobs that required a college education; by comparison, only 44.7% of area studies majors (those focused on specific regions or cultures) were likely to have a job that required a college degree. In other words, if you're majoring in Eastern European studies, don't forget to learn how to make a White Russian.